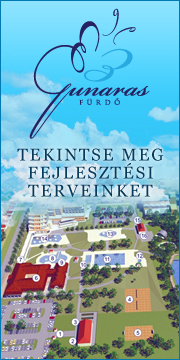 Gunaras Gyógyfürdő és Idegenforgalmi Zrt, one of the most dynamically developing regionally certified medicinal spa of South-West Hungary welcomes you. Thank you for choosing us as the venue of your healing, relaxation and entertainment. Allow us to provide you with some useful information that can make your visit more enjoyable. The spa is divided into two major parts: one of these is the open-air swimming pool that is only open in season, and the other, the indoor medicinal spa and the medical section that operate around the year. Wellness services are also housed in the indoor spa. The spa is situated in a 8-hectare park. The open-air swimming pool (open only in season) offers a variety of experiences that will suit any age: there are two sitting pools with medicinal water, an adventure pool for children, a swimming pool, a competition pool, three adventure pools, a pool with a diving tower, a slide park with six slides and a pool into which the slides lead. If you feel like playing ball, you can choose from two sandy beach volleyball courts, a beach football pitch, a basketball board, a table tennis table and a footvolley court. Visitors can have a rest in the shadows of the trees surrounding the 1-hectare lake. A changing room with lockers is available to visitors free of charge. The changing room is located right next to the main entrance of the open-air swimming pool. The spa has its own locked parking lot, which provides direct access to the main swimming pool entrance. The indoor swimming pool welcomes those who wish to heal or refresh themselves or to have a rest around the year. There is a cooldown swimming pool with medicinal water here, along two sitting pools with medicinal water, a sauna swimming pool, a sauna dipping pool, an exercise pool and a weight bath. Outdoors, but directly linked to the spa, are two adventure pools. Our wellness services offer refreshment to the body and the soul. Visitors can enjoy the Finnish sauna or the infrared sauna, which are equipped with light, fragrance and music therapy facilities, or may choose the steam shower cubicle, the open-air Finnish sauna house, the Jacuzzi or the solarium. The salt therapy room offers a remedy for a variety of respiratory and skin conditions. We also offer unique feng shui body treatments, detoxifying and stress-relieving programmes. Visitors can choose from a variety of massage treatments, including traditional Swedish massage, body massage using essential oils, honey or chocolate, or a form of massage specifically developed to reduce cellulites. Reception, the rheumatology practice and a lounge are situated in the foyer of the indoor spa. The rheumatology practice is open on weekdays between 8 am and 2 pm. No need to make an appointment or to have a referral. If you have the results of previous medical tests, please bring them along to help the work of our doctor. You must pay the entire fee for the treatments in advance at the till. Please make an appointment for your treatments with the dispatcher. Treatments must be started within 30 days from completing the treatment sheet. Please arrive on time to your treatments. Missed appointments can only be completed if you can present a letter from a doctor and make a new appointment. The fee of unused treatment sessions will only be refunded if medically justified, a letter from a doctor is presented, and a protocol is produced. Before starting your treatment, please peruse the House Rules of the spa. Except for massage, treatments can only be used if prescribed by a specialist physician. The spa is accessible by wheelchair. For more information, please call (74) 465-454.